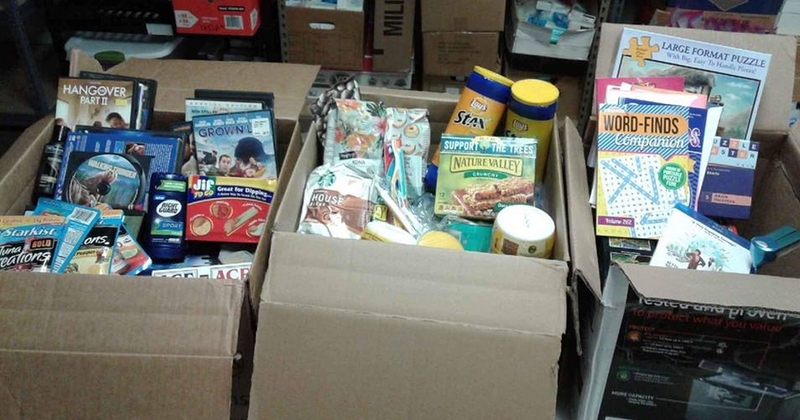 An Eighth Grader from Idaho Donates Items for the U.S. Troops. 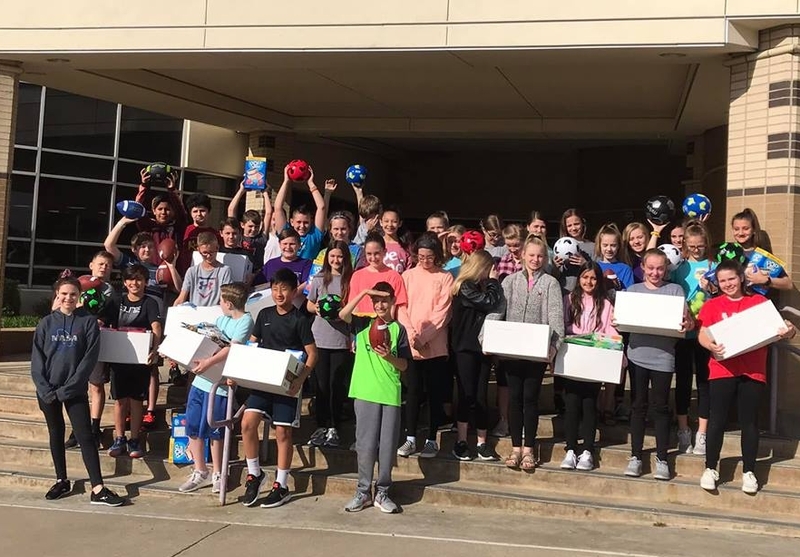 We want to thank Ethan, an eighth grader from Idaho, who held a goods drive for the second year for his Lenten project at school. Here is the letter he wrote to the soldiers and some pictures of the items he collected. 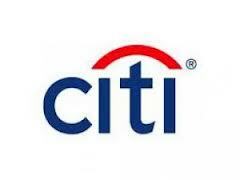 might learn from, please do not hesitate to write to the address above. Thank you again for all that you do every day. You all make a difference! Ethan, an eighth grader from Idaho, collected goods for the troops. 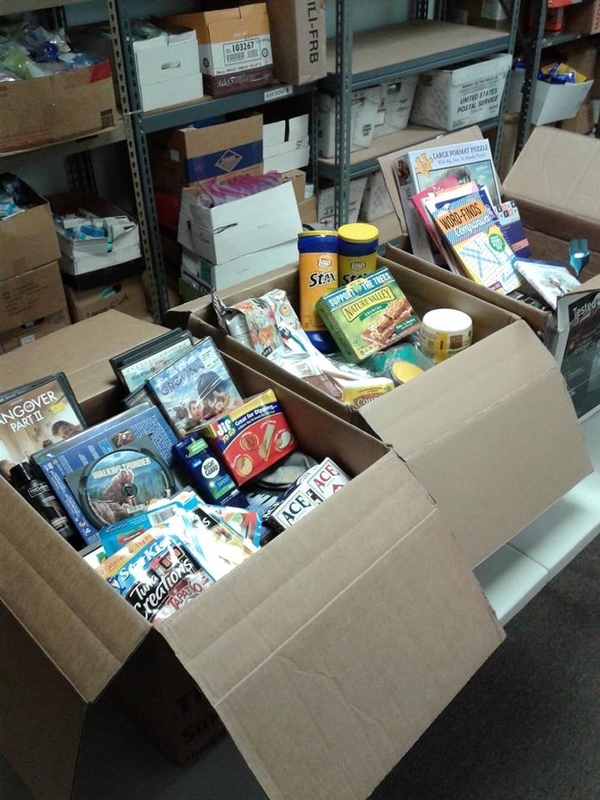 The items Ethan collected were food, snacks, DVDs and puzzles. The Airborne Angel Cadets of Texas are happy to support our troops overseas. There are many ways you can help; you can send requested items to us to be included in the care packages, donate funds through the Click and Pledge link at the top of the page, Venmo us at Nancy@AirborneAngels or send checks made payable to: Airborne Angel Cadets of Texas, P.O. Box 116691, Carrollton, TX 75011. 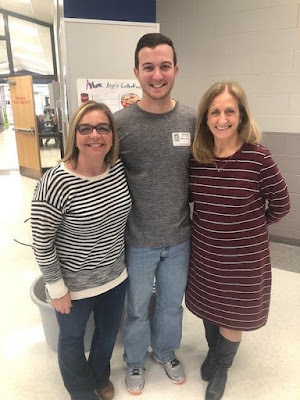 Thank you Downing Middle School for your Donation. for your generous donation of goods for the soldiers. The donation of items will be included in our care packages for U.S. Soldiers, Sailors, Airmen and Marines deployed overseas. Thank you Old Settlers Elementary in Flower Mound, TX, for your donations of goods and money. The goods will be added to our care packages and the funds will go towards postage costs. Matt is the son of one of our Angel Families whom we have supported during his deployment. It is so nice when the soldiers we have supported come home and continue to support our mission. 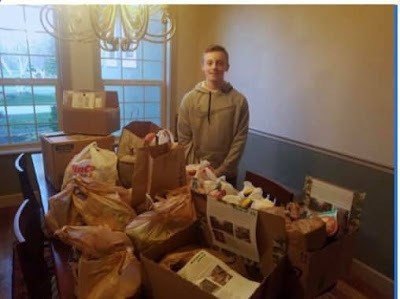 Matt and his mother had the pleasure of going and picking up these goods of which the school collected via their Old Settlers Elementary Giving Tree Drive. 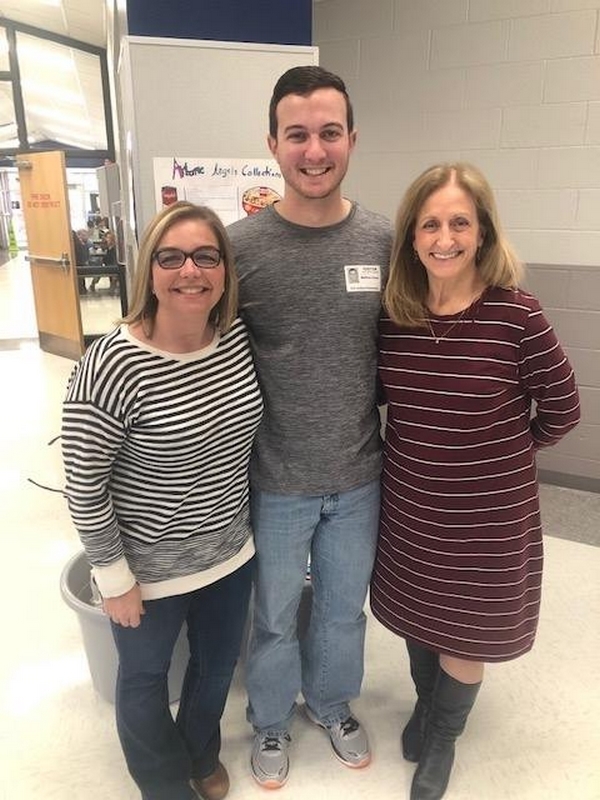 Olivia Dunaway, his fifth grade teacher, on the right. and postage money for our troops. 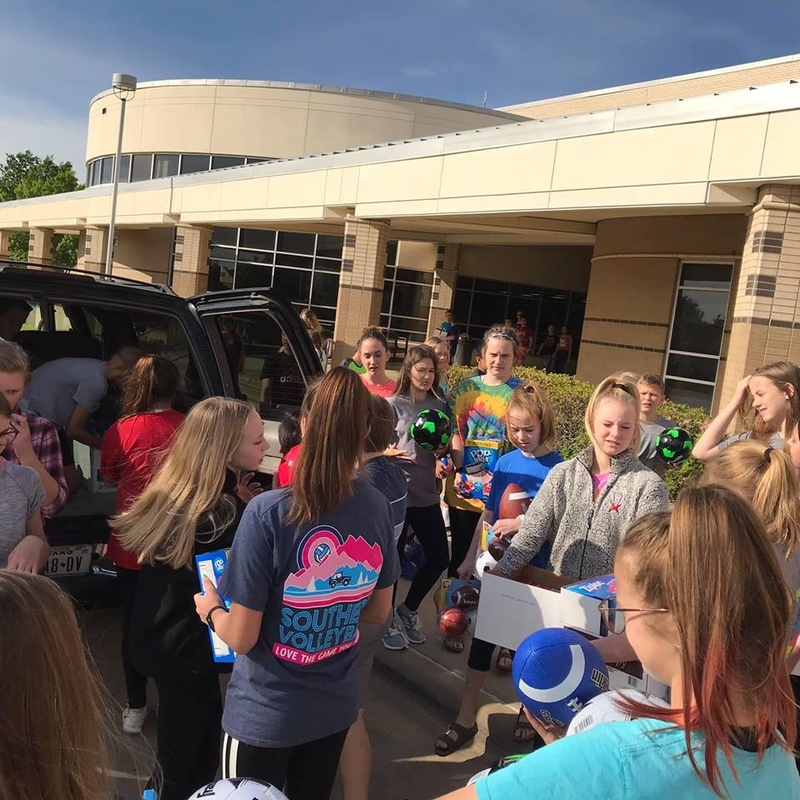 Care Packages "brightened their days after long hours and back-to-back missions"! 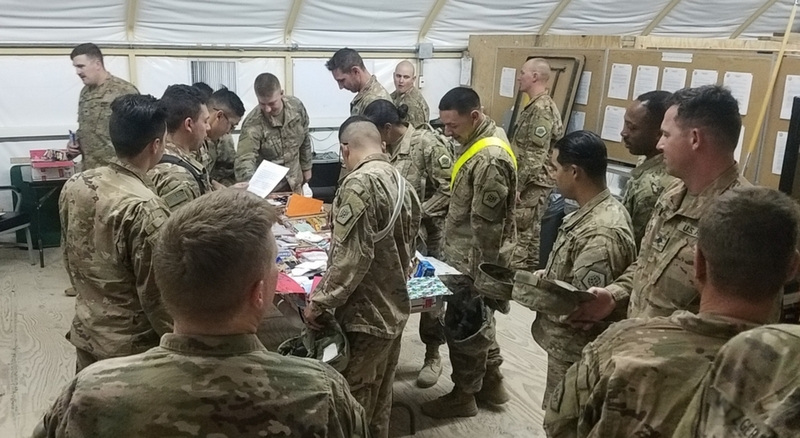 Here is a thank note along with some pictures we received from a unit that received some of the care packages we packed and shipped last month. As you can see, these boxes of toiletries and goodies are greatly appreciated. I am excited to say that most of the packages have arrived! The soldiers were surprised with the gifts and cards. I attached photos of one of the groups that enjoyed them. It brightened their days after long hours and back-to-back missions. In fact, the company commander is asking me to request packages for our brothers and sisters in other locations, can you show them some love, too? Most of those sites do not have access to normal amenities such as a Post Exchange. We appreciate the thought that went into our packages. Please thank all the volunteers from Texas for us! You are amazing! 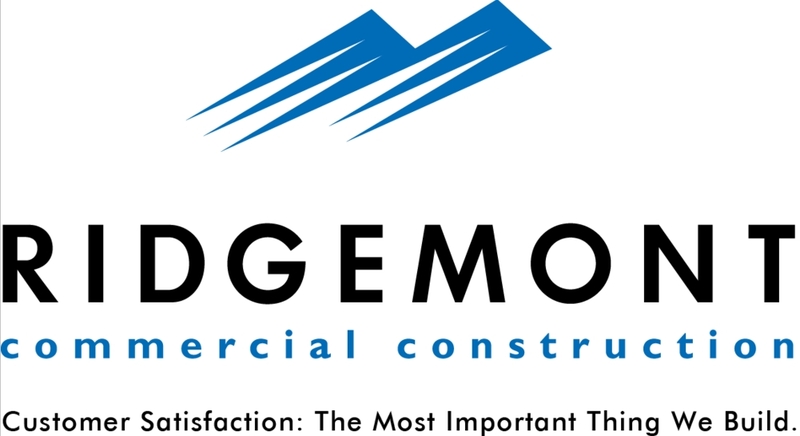 Take great care and thank you for your support! I hope to hear back from you, soon! The soldiers were lining up to see what the care packages contained. These boxes were decorated with "love notes" from some of our local students. 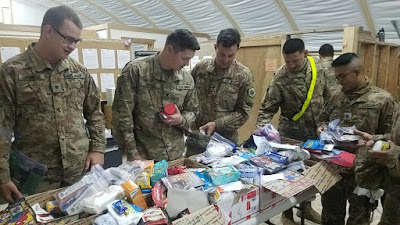 The soldiers are "shopping" through the care packages. 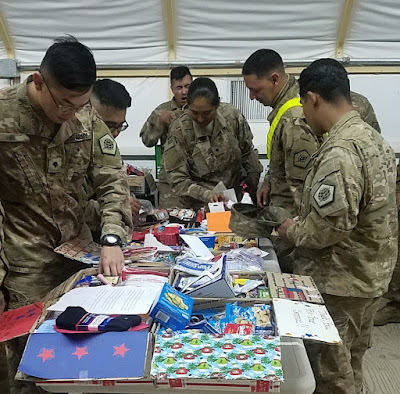 The care packages brought smiles to the faces of these soldiers. 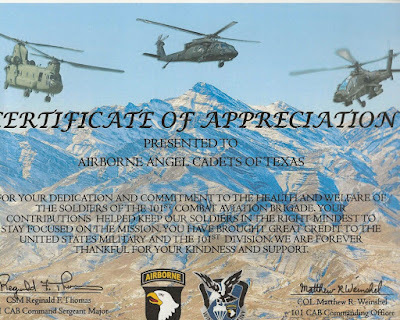 The Airborne Angel Cadets of Texas are honored to support our troops overseas. There are many ways you can help; you can send requested items to us to be included in the care packages, donate funds through the Click and Pledge link at the top of the page, Venmo us at Nancy@AirborneAngels or send checks made payable to: Airborne Angel Cadets of Texas, P.O. Box 116691, Carrollton, TX 75011. 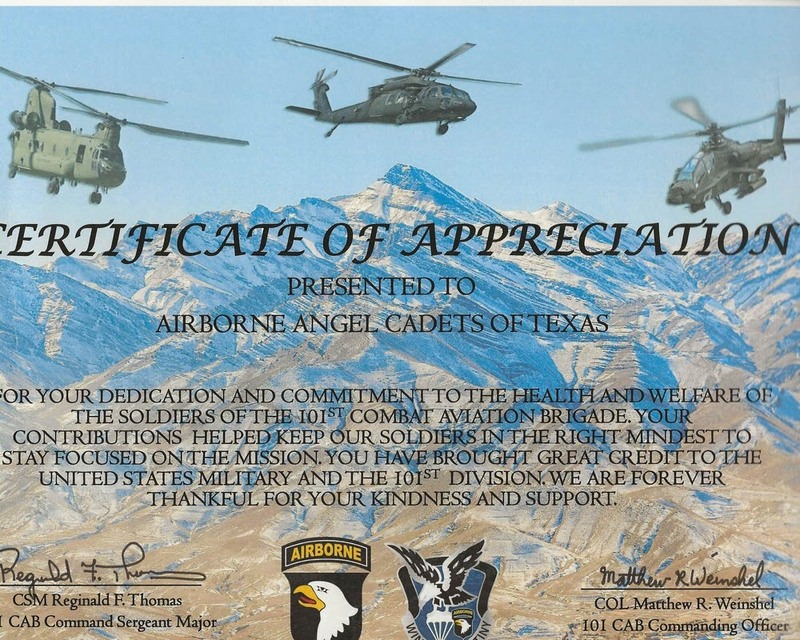 The Airborne Angels of Texas are honored to receive this Certification of Appreciation from the U.S. Military and the 101st Division. 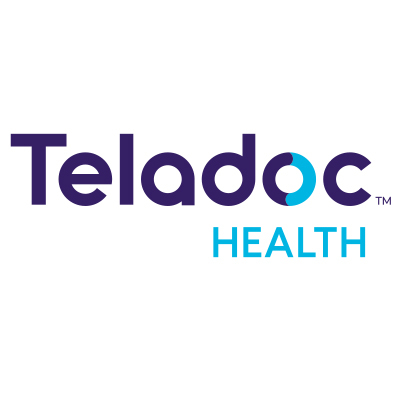 We are proud to serve our military by sending care packages to our soldiers serving overseas. You can help support our troops by sending requested items to us to be included in the care packages, donating funds through the Click and Pledge link at the top of the page, Venmo us at Nancy@AirborneAngels or sending checks made payable to: Airborne Angel Cadets of Texas, P.O. Box 116691, Carrollton, TX 75011. 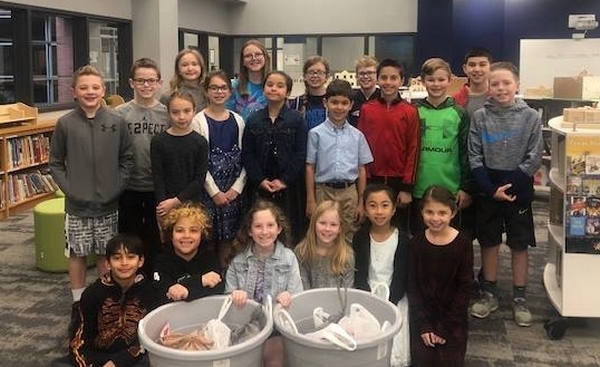 Thank You Frisco Young Men Service League for your Donation! The Frisco Young Men Service League (YMSL) dropped off a donation of batteries, razors, jerky, deodorant and toothpaste along with thank you notes and gift cards. Plus, they also donated flat rate boxes that were decorated with "love notes" to the troops. The gift cards will be used to purchase other items needed for the care packages. We include the thank you notes in every care package we ship. 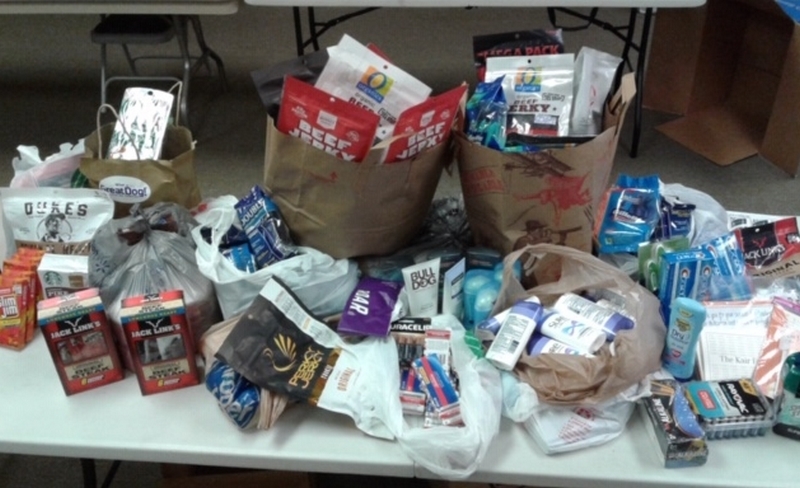 Items donated by the Frisco YMSL included jerky, batteries, deodorant and razors. 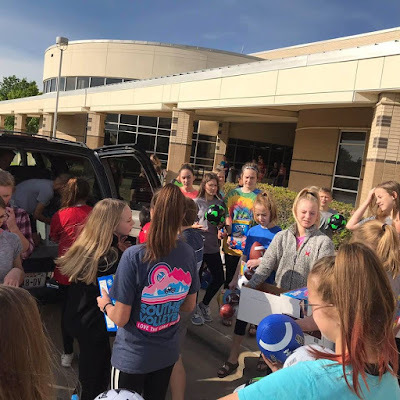 Thank you Frisco YMSL for your support. 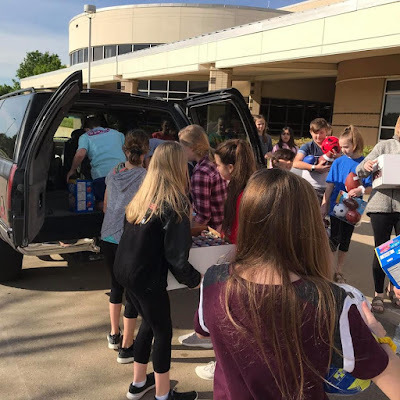 The Airborne Angel Cadets of Texas and some great volunteers from Preston Bluebonnet National Charity League and Classic Chevrolet packed over 460 care packages totaling almost $8500 in shipping costs for the U.S. Military troops stationed overseas at our packing party on Saturday, March 23. 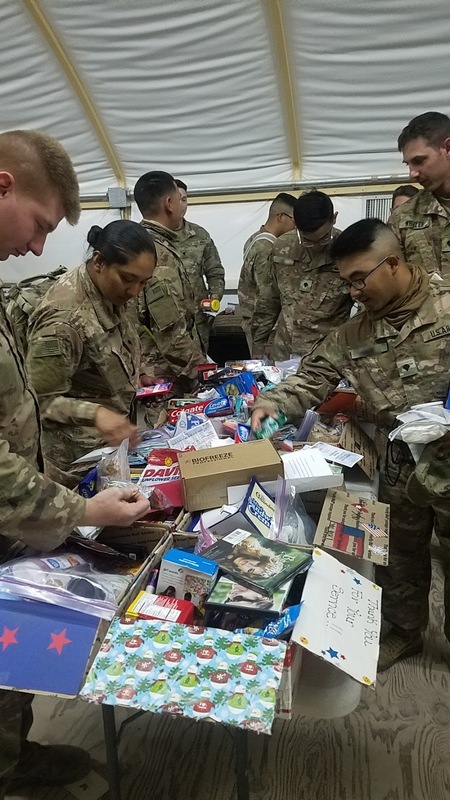 These care packages will be shipped to Soldiers, Sailors, Airmen and Marines in Afghanistan, Iraq, Africa and the Mideast. The care packages were packed with toiletries, snacks, microwavable meals and notes from supporters. 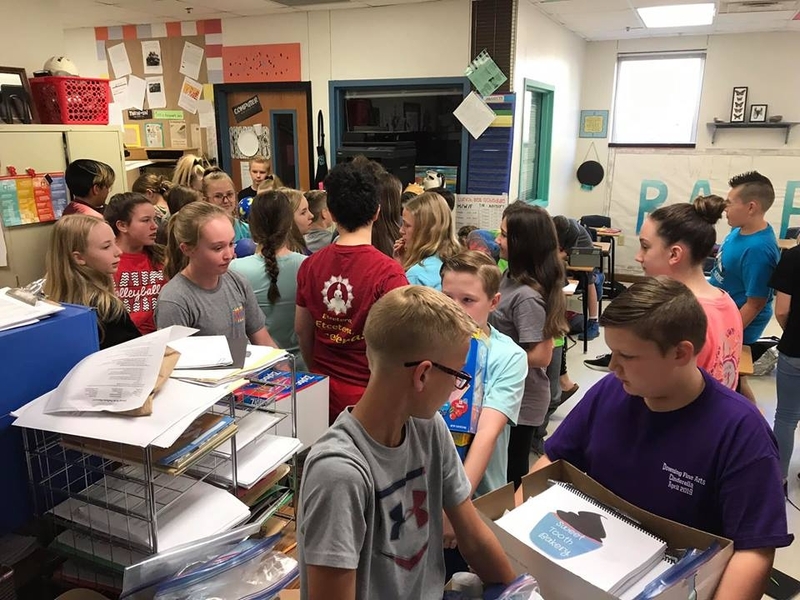 The theme for this packing party was "Greetings from Texas", so the boxes also contained Texas themed t-shirts, pinatas, chips and salsa plus other fun items. The care packages contained food and snacks plus toiletries and other goodies. Volunteers from the afternoon packing party. This volunteer from Classic Chevrolet packed 4 boxes at the same time! The tapers from the afternoon session. The Airborne Angel Cadets of Texas are proud to support our troops overseas. There are many ways you can help; you can send requested items to us to be included in the care packages, donate funds through the Click and Pledge link at the top of the page, Venmo us at Nancy@AirborneAngels or send checks made payable to: Airborne Angel Cadets of Texas, P.O. Box 116691, Carrollton, TX 75011.